Writing up the right answer were Susan, Cheryl, Kara and Soma. This week we are back to one of my favourite towns and we continue the literary theme. 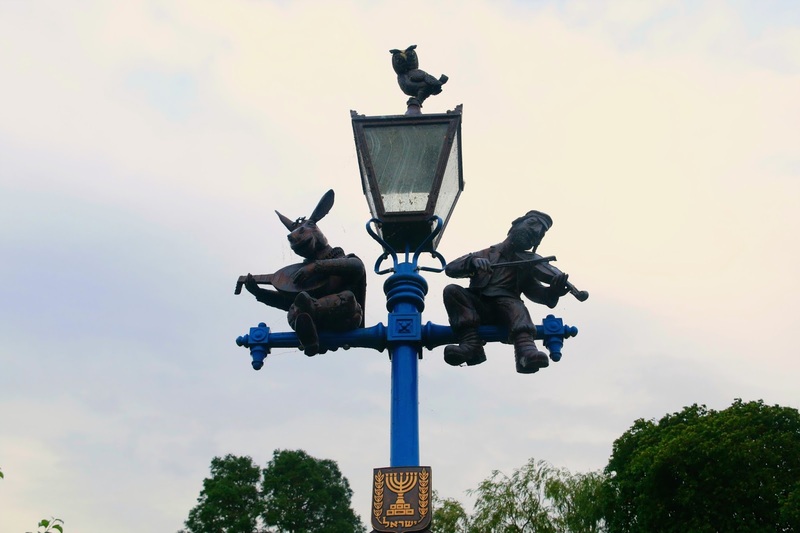 This lamp post is in Stratford-upon-Avon and there is a Shakespeare connection to it. Along the roads around the Royal Shakespeare Company are a number of lamp posts which have been donated by councils and organisations around the UK and further afield. I don't know how the local council managed to persuade other councils to fund their lamp posts but they did! On most them there is frame attached to the post with the name of the benefactor but this stands out. It was commissioned by the State of Israel through the Jordan. P and Irene Callig Synder Foundation. It has three characters on it from three different works but no explanation as why they have been put together! Can you name any of the poems, musicals or plays that these characters appeared in? We were joined last week by Susan and a trip to Tattersall Lakes. Cheryl left us wondering whether is was a dog or baby. Kara has been in Top Gear with a meeting with The Stig and a fast driving experience. Finally, there has been a musical theme to Soma's recent quilt creations. If you want to join in with this week's Sunday Snap then add your link to the linky below. Any theme is allowed. It doesn't have to be published today as you have until 23.55 on Friday 28th July 2017 to join in. Grab my badge below for your blog post. Just make sure it is your photo and you hold the copyright for it. Tevye is from Fiddler on the Roof.